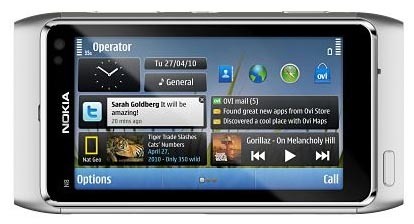 The Nokia N8 smartphone, touchscreen and running the new Symbian^3 operating system, is due for a fourth quarter 2010 release. Nokia has just released details of the release of the N8, its latest touchscreen, N Series smartphone. The Nokia N8 is the first Nokia phone to run on the new Symbian^3 operating system, the first fruit of Nokia doling out the Symbian code to the open source community. There’s more on Symbian^3 below. The N8 continues the trend of Nokia’s NSeries, indeed more and more smartphones these days, of making them very much portable content creators, with the 12 megapixel digital camera, 720P HD video, and in-phone image editing. Social media is pushed front and centre, with Facebook and Twitter feeds on the homescreen, or they’re one click away from phone’s address book. Out of the box there’s free worldwide satellite car and walk navigation from Ovi Maps – over 70 countries. To make your mapping experience really pop, there is also built-in premium guides from Lonely Planet and Via Michelin, offering localised travel, restaurant, weather, and hotel tips. And like the HTC Desire, the Nokia N8 has separate, customisable homescreens – three in total. There will be a choice of five colours: Dark Grey, Silver White, Green, Blue and Orange. 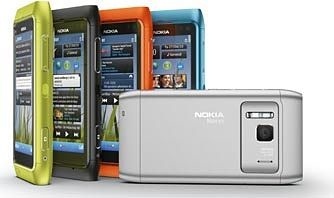 The Nokia N8 will now go on sale in Australia in late October. The Nokia N8 price will be an RRP of $749 when bought outright. There will be a choice of five colours: Dark Grey, Silver White, Green, Blue and Orange. For a look at some more pictures, more videos, and generally more things Nokia N8, take a look at all of our Nokia N8 stories. Very true, in the midst of the long list of specs I did miss some networking aspects. I’ve added a bullet point for the Data specs.